Boston Building Resources continues a history of providing home improvement materials and increasing customers' knowledge that began when our co-op was formed in 1978. Boston Building Resources continues a history of helping people with home improvement materials and knowledge that began in 1978. Terrace Street circa 1993. At the far left are two trailers housing the new Reuse Center. As the energy crisis of the 1970s caused home heating costs to skyrocket, a group of Boston residents were determined to help their neighbors who were living in drafty, uninsulated homes. They founded the Boston Building Materials Co-op, first located on Plympton Street in the South End, in 1978, with the vision of providing people with a source of affordable materials to make their homes more energy-efficient, and the knowledge of how to do the work themselves. 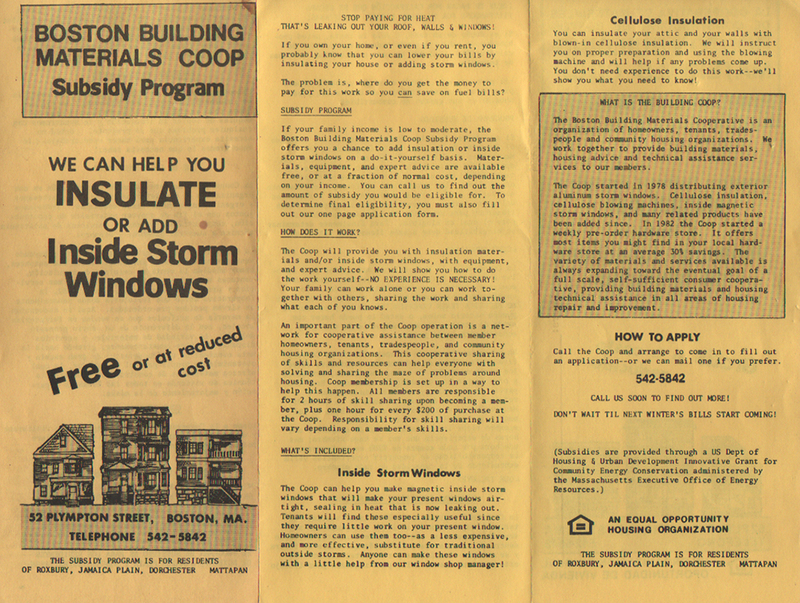 The Co-op’s first years were focused on providing blown-in cellulose insulation, window repair, and high-quality storm windows. Over the years, the Co-op expanded its offerings, especially in the area of kitchen cabinetry and kitchen design. The organization moved to its current Terrace Street location in 1990, into a building that was designed for maximum energy efficiency and passive solar heating by founder John Rowse. 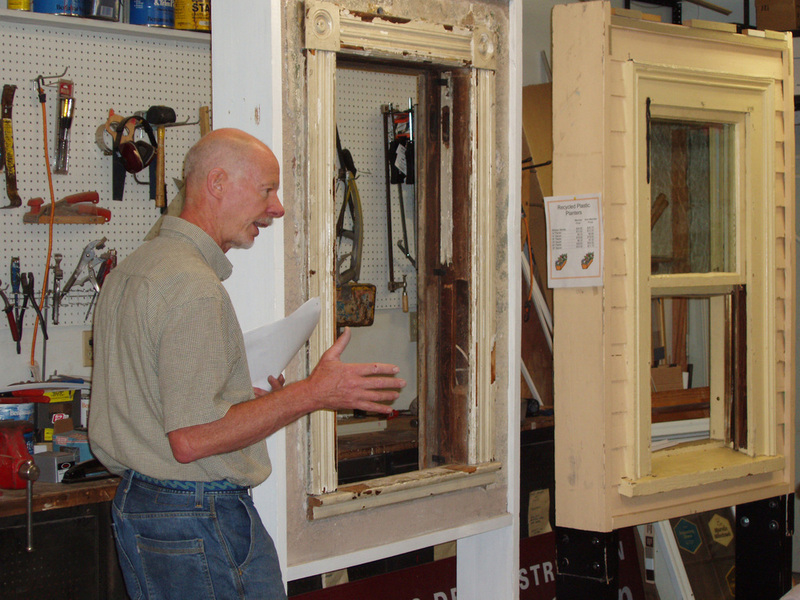 In 1993, the Boston Building Materials Co-op Charitable and Educational Fund started the Reuse Center, known for many years as the Building Materials Resource Center. Co-op members who worked in the construction and architecture fields saw how much reusable material was being discarded while, at the same time, many homeowners struggled to afford the materials they needed to keep their homes in good repair. The Reuse Center was founded to divert good materials away from becoming waste and direct them toward hardworking homeowners. 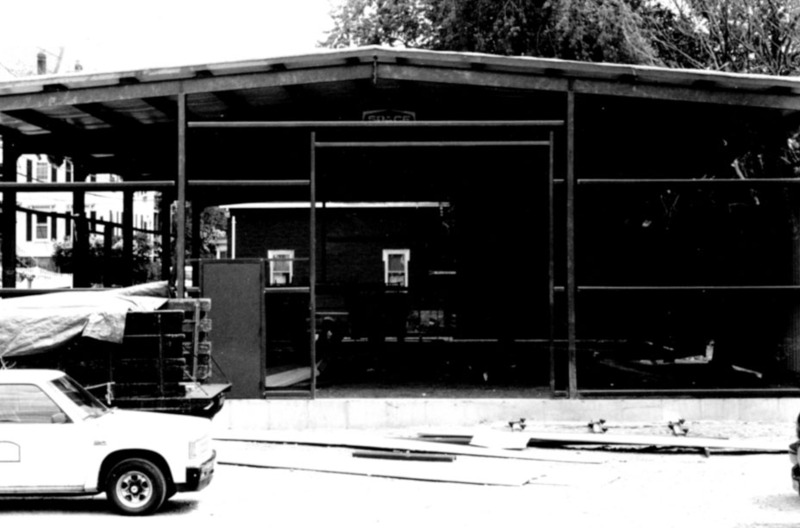 In its first three years, the Reuse Center operated out of unheated trailers and shared showroom space with the Co-op. Its current building was constructed in 1997 and expanded in 2006. Sales of donated materials, from a handful in the early years, grew steadily: In 2015, 1,963 income-qualified people made purchases, and materials valued at more than $2 million were donated. The change to a single name, Boston Building Resources, was made in 2011. The underlying separate legal structures remain the same: a consumer co-op and a charitable nonprofit, working side by side.